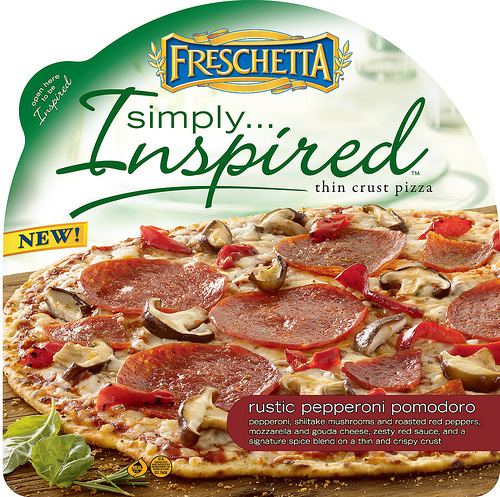 We wanted to let you know about the great new pizza line from FRESCHETTA® called Simply Inspired. The first thing is FRESCHETTA® Simply…Inspired™ is not your average frozen pizza you know when it is from FRESCHETTA they are not going to skimp on toppings and flavor but the Simply Inspired line comes in eight distinctive flavor varieties. This time they have hit a home run with Quality the taste of toppings and their killer signature sauces. The first thing you will notice is no cardboard box you have to see the new FRESCH-TASTE SEAL™ Packing as we believe it keep the pizza from freezer burn as we moved it from the grocery store to the home freezer and then to the oven on pizza night. This new FRESCH-TASTE SEAL™ Packing locks in the vibrant flavors, while using 30% less packaging material. So it is a win for going green but it also makes the pizza fresher. The Thin & Crispy Crust style was amazing for a frozen pizza usually these are soggy and soft but the FRESCHETTA® Crispy Crust style was kept intact and crispy throughout. There are eight great-tasting varieties, Classic Bruschetta, Hawaiian, Chicken Bianco, Farmers Market Veggie, Southern BBQ Recipe Chicken, Tuscan Farmhouse and the one that was devoured at our house Rustic Pepperoni. – FRESCHETTA® has social media as you should follow them on Twitter at @FreschettaSI and “Like” them on Facebook at www.facebook.com/FreschettaSim…. The Facebook page is offering weekly giveaways of awesome prizes through the rest of 2011. Keep checking as starting soon, they will be offering the opportunity to download a $2 off coupon for FRESCHETTA® Simply Inspired on Facebook. If you follow them on Twitter and Like them on Facebook come back her and leave a comment that you did. We will draw a name from a those commentaries’ at the end of the month and FRESCHETTA® Simply…Inspired™send you a coupon for a free pizza and a special prize we will reveal on May 30,2011. The top globalist and former Secretary of State Henry Kissinger seems to be changing his spots as of late. In 2002 he was against the war in Iraq and spoke right to President Bush and anyone who would listen. Kissinger uses the rationale for the war in Libya that the Trilateral Commission and Bilderberg, wants to keep the war going and add US ground troops. He wants the war extended through 2012 to generate turmoil throughout the Middle East and pressure the United States into attacking Iran on behalf of Israel. You would think this might be only one account but Kissinger gave almost the exact same speech at three different conferences at the George Washington University’s Elliot School of International Affairs, then at an Aspen Institute, and during the Bretton Woods II conference. The fact that the United States is in three major conflicts and can barely service its own massive debt. We find just a little off from what has been termed The top globalist in the US. This feels a little like a want than a more thought out policy. We are now entering the tenth year of the occupation of Afghanistan, and with US forces still tied down in Iraq, and the last estimate at the beginning of April say we already spent an estimated $608 million dollars to pay for the intervention in Libya. Author tea512Posted on April 22, 2011 November 13, 2018 Categories UncategorizedTags ground troops, Henry Kissinger, Secretary of State, Secretary of State Henry KissingerLeave a comment on Kissinger wants ground troops? and Anna Paquin. We are not sure she will make the top 51 at the end of the year but we did want to give her a week because of being the sweetheart we have enjoyed over the last five seasons of FNL. We wanted to let you know if you are looking for a Florida home builder then the people over at Kolter homes has you covered. They are headquartered in Palm Beach County. Kolter Homes has more than a decade of experience in Florida home building to each of its neighborhoods in South Florida. We all know that buying a house is a major investment. If you are looking for a company that is committed to building valued residences and in Creating Better Communities, if you are a home buyer you know it not just about purchasing a home, you are purchasing a dream and a new lifestyle. The Kolter team strives to deliver the desirable finishes and amenities. When it comes to offering a menu of finishes which are among the most sought after in the industry which include things like Green Builder Options so that their customers can take advantage of the newest energy efficient home options. Since 1993, The Kolter Group and its affiliates have sponsored over $9 billion of real estate transactions across multiple assets and geographies. The website is top notch as you will love all the information and do not miss the blog which has posts that are topical and current with real estate changes. The last piece is that you can click on the warranty and all the important information is listed that will set your mind at ease and prove that Kolter Homes. Well Monday looks like a day of double speak as President Obama is set to address the nation and a Congress with some kind of answers. This will be President Barack Obama most expansive explanation of the U.S. role in the Libyan war. This means the president will deliver a speech that is expected to cover the path ahead and his rationale about the appropriate use of force. The location is going to be from the National Defense University in Washington. This comes as many in the nation have pressed him for clarity about the goals and exit strategy of the United States. President Obama is expected to explain how the U.S.-led campaign is shifting to NATO control, and how the multinational approach with Arab support puts the United States in the strongest position to achieve the goals of protecting Libyan civilians. We think it is just a war for oil. You know when you get one of these hawkish presidents in office one war is never enough how about three. We are waiting for the national media to create lawsuits to watch and photograph soldiers bodies get off planes at Dullas. It seems tongue and cheek but this was in play when President Bush was in office, the lame streamers thought we would forget. When you are looking for the perfect dining table you have a lot to consider. After you have selected the main furniture you want for your dining room, let your inner decorator show by adding pieces that show off your sense of design. Look through the selection of curio cabinets and china cabinets to see if anything catches your eye, or browse our assortment of pub sets and home bars. At More Dining Tables, they are confident you will find what you are looking for, all for a very low price. The selection of dining room furniture is extensive, and they carry products from some of the top brand name manufacturers around, including Global Furniture USA, Coastal Living by Stanley Furniture, Fairmont Designs and more. Choose from a selection of modern and contemporary dining tables to keep your dining room on the cutting edge of design, or find something with a more traditional look. Buffet tables and sideboards are also available. Whatever you’re searching for, you’ll find it at More Dining Tables. This is a Sponsored post written by me on behalf of CryoCell International. All opinions are 100% mine. We wanted to let you know about the latest promotion from www.Cryo-Cell.com. You can get a free BellyBag. The campaign is called It’s Your Baby’s Life Learn More. You can request an information packet and learn more about this service. They can get you in touch first with an initial consult then with Advisor that can awnser all your questions and do not forget your free BellyBag! This is not a new thing and www.Cryo-Cell.net has been doing this since 1992. They have helped more than 230,000 clients worldwide. Today the technology is getting better by the day and to think you can preserve a newborn’s umbilical cord blood for potential use against many diseases is proof we have come a long way . Cryo-Cell Cord Blood Bank is pioneering the way in research, to find more solutions to preserve stem cells in a noncontroversial way. Cord blood is just the first step in new medical advancements. You have a once-in-a-lifetime opportunity to preserve your baby’s cord blood, trust it to the experts at Cryo-Cell Cord Blood Bank . This does come down to money and when making the decision to store your child’s cord blood, you’ll need to balance the financial aspect with your own set of values, needs and wants. This week we are going to highlight a new comer to the list. Teresa Palmer who was born on February 26, 1986 in Adelaide, South Australia makes the grade this week. Teresa officially moved to Los Angeles in 2007 to be a full time actress. She made her film debut in the suicide drama 2:37. We put her on the list after her red carpet walk and premier and her movie I am Number Four opened this weekend. The movie finished second opening weekend taking in $19 million. Teresa has been in some major movies already in her career with big name stars. We first seen her in The Grudge 2, some of these other major roles include December Boys, Bedtime Stories, The Sorcerer’s Apprentice with Nicolas Cage and Jay Baruchel. Her upcoming films include Take Me Home Tonight, which is a movie about the good old 80’s in March and later in the year she will be in the release of Say Nothing. If you have ever seen her on the red carpet you know why she made the list. If you have ever seen her melt the big screen you know it was about time she made the list. Teresa has an awesome body, great curves, big smile, and usually long blonde curly hair. We wanted to let you know about Battleship Cove as a great place to spend the day, have fun, learn a little history. This place is open year round and the cost of admission is only $15 children 6-12 are $9 and under $6 is free, there is also free parking. The place has been entertaining for 40 years and puts you in the heat of the action. You can view a lot of history and the slogan at Battleship cove is “Don’t just learn about history live it.” When you are at Battleship Cove, you will experience firsthand what it was like to serve on board a Navy warship in WWII. You can sound the diving horn on Submarine Lionfish before you slip below the sea. The best part was cranking the handwheels on Big Mamie’s 40-mm guns as you knock enemy planes from the sky. The biggest treat for most in attendance was the sail through the Cold War on USS Joseph P. Kennedy, Jr. We also learned the ship had an unmanned helicopter that hunted Soviet submarines. It was amazing to think we had predator technology back in 1960. They also have a high-speed missile corvette that the Soviets designed to fight us. It does not matter if you are a die-hard naval history buff or a casual enthusiast of military hardware, you’ll have much to discover at Battleship Cove. you can find all the fun at Battleship Cove, 5 Water Street, Fall River, MA 02721.